Next up we have the IWGP Tag Team Championships up for grabs, as champions Tama Tonga and Tanga Loa look forward to retaining their titles, having captured them from The Young Bucks back at Fighting Spirit Unleashed. 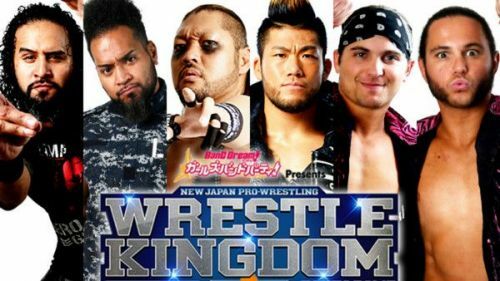 The Young Bucks make their way out first, followed by the LIJ team, and then champions, who were accompanied to the ring by Bullet Club members Bad Luck Fale and Jado. Tama and Nick Jackson start us off, as Evil quickly makes a tag in replacing Tama in the match. This eventually leads to a wild brawl, with Evil attacking Matt's already injured back. Meanwhile, back in the ring, Loa is in and slams Evil for a close 2-count. GoD is working as a team but it is The Bucks who clear the ring instead. The Jackson Brothers work on LIJ, with Matt locking in the Sharpshooter, whereas, Nick takes out Sanada with a dive. LIJ start to make a comeback, with Sanada getting the tag in to apply the Paradise Lock on Nick. Sanada hits a dropkick to Tama and planchas onto everyone, as he gets a huge pop from The Dome crowd. Skull End from Sanada only for Nick to make the save, as it breaks down between all the teams. Magic killer by LIJ, Matt hits a spear, and we get a tower of doom, only for a 450 from Nick Jackson. Bullet Club shenanigans finally start to unfold as Jado and Fale try to interfere, Jado gets taken care of by The Bucks who hit a Double Superkick on him. Fale gets clotheslined out of the ring by Evil. In the closing stages, The Bucks look to finish off the match by hitting the IndieTaker but Tama hits a Gun Stun, Magic Killer by LIJ, followed by a Moonsault from Sanada as we have new champions. Sanada and Evil win the IWGP Tag Team Titles for the second year in a row at Wrestle Kingdom.